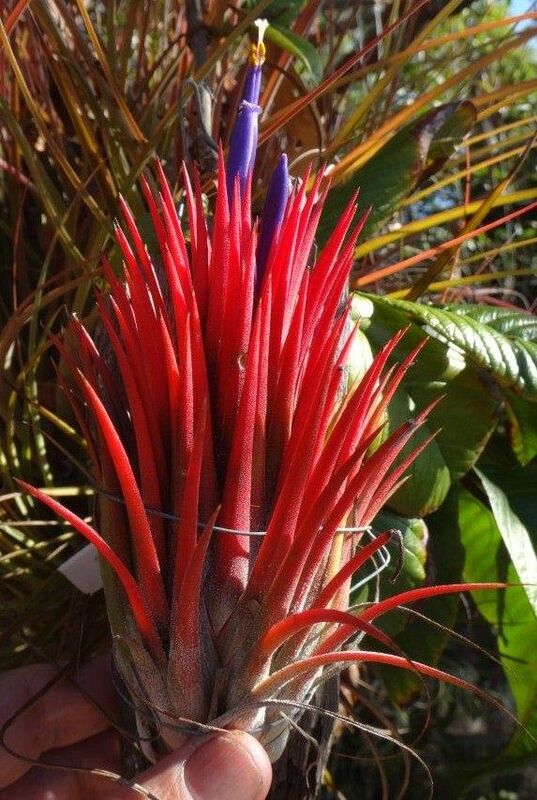 There are many ionantha in circulation as "Cone Head" which may not be correct. The name is being dangerously applied to unknowns that MAY look similar under some conditions. Derek Butcher 7/5/18 ... 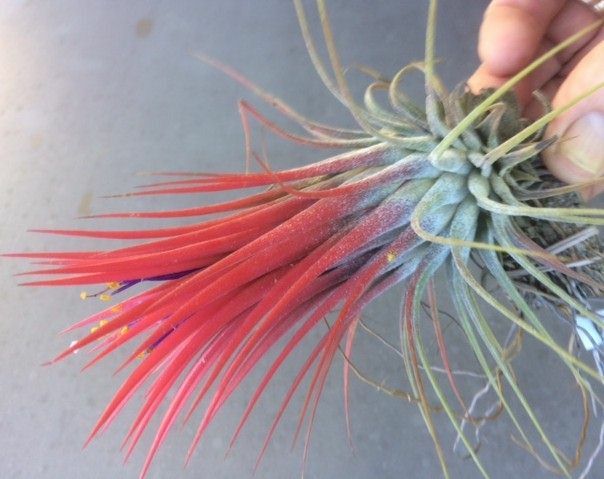 I have always said that all ionantha look alike to me. So I was rather intrigued with the latest posting of 'Cone Head' from an Australian grower in the BCR. The name is a mystery and appears to be a Nurseryman's Name emanating from Tillandsia International. At least their photo looks like a cone but to my ancient eyes the Australian version does not look like a cone. Does anyone know how this named clone got into Australia. I would suggest that growing conditions in California would equate with most of Australia. John Olsen 9/5/18 ... My 'Cone Head'. The larger plant is ~8cm high. John Olsen 9/5/18 ... Picture of my plants labelled as 'Cone Head' on right and 'Penito' on left. John Olsen 9/5/18 ... My 'Penito'. Rather similar to 'Cone Head' but larger and a touch redder. Chris Larson 9/5/18 ... 'Penito'. The plants we imported from Guatemala for quite a few years contained T. 'Penito' - I have seen 1000s. It was in no way similar to John's plant. It was always very large with succulent leaves. It is however similar to Rob's plant, though. It did vary a bit, and most elongated with age. Not that I am saying that Rob's plant (a photo of which is attached) is 'Penito' - but I couldn't argue against it. Neville Ryan 11/05/18 ... Regarding T. 'Cone Head' my plants came from Keith Golinski probably in the early 1980s, I think. 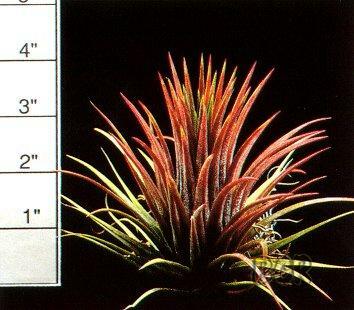 It has always just been a larger form of T. ionantha to me, I have wondered where the 'Cone Head' name came from. Derek Butcher 13/5/18 ... (re: Greg Aizlewood image of 'Cone Head' on Facebook) If I was confused at the start of fhis project of mine, I am more confused now. We do need free discussion especially about provenance so details can be recorded. In this case I am confused because the plants are flowering early and don't have the 'Cone Head' shape. They all look the same age. Are they seedlings? More detail is needed. Did these originate from Golinski too? 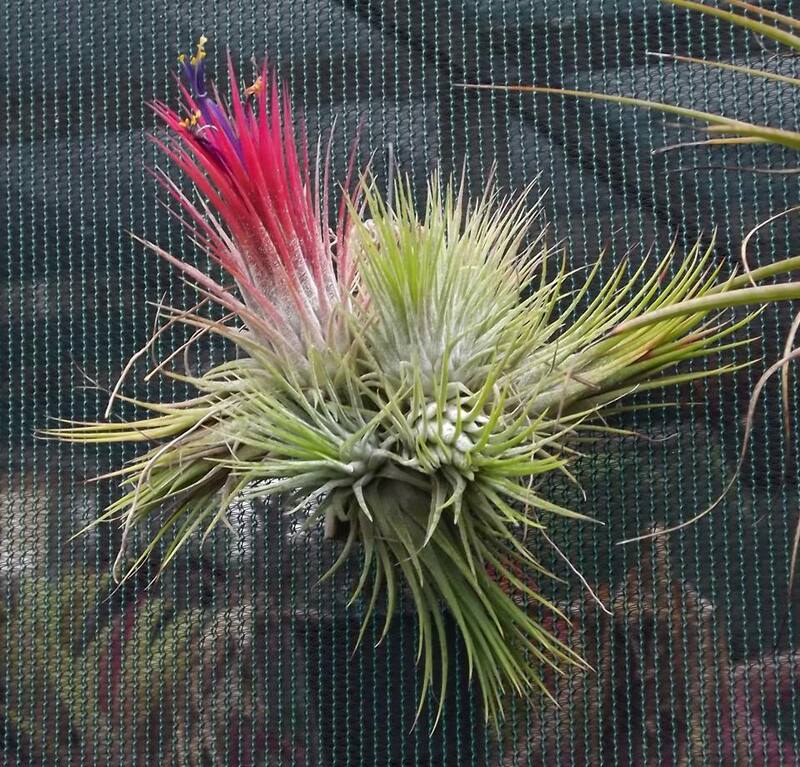 Greg Aizlewood 14/5/18 ... Hi Chris, I am in the process of confirming the ID of a bunch of various forms of T. ionantha I got from Dennis Cathcart in 2009. The version of 'Cone Head' I have been growing came from Dennis and was described to me as resembling the side view of an ice cream cone by his very able female attendant. Another that I had pointed out me at the time was a form that was collected in Honduras. I have kept that name on this particular form because it flowers during our winter as opposed to the other varieties I have and has a shape very similar to the form of the plant refered to as 'Fuego' in the New Tillandsia Handbook. Similarly, the clone of T. 'Large White' (Sumo) flowers at a different time to the clone I got from Russells Broms in Florida yet they are reputed to have come from the same source. I don't envy your job trying to sort it out especially when these plants seem to take on various shapes and form as a result of changes in environment and culture. 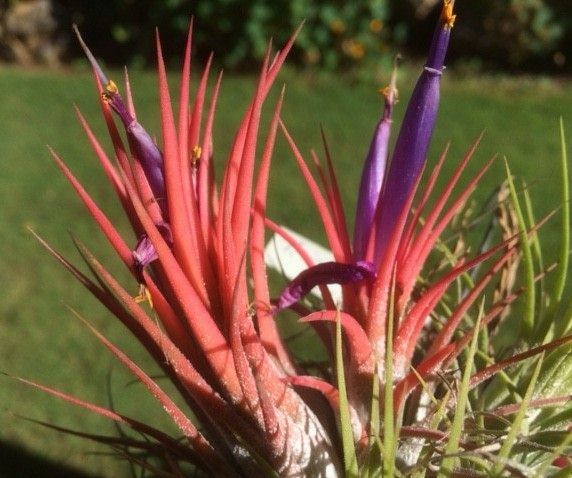 I have only recently reread an article by Mulford Foster in an early BSI Journal where he refers to various T. ionantha irrespective of shape or form as being just T. ionantha. If only it was that simple. Chris Larson 14/5/18 ... Thanks Greg: But I believe it is that simple. For years, I believe, Collectors Corner has unleashed more ionantha, and ionantha forms, onto the market here in Australia than any other source. Unless someone else names them – I/we will not use any cv names or register new ones. So many growers wanting names are looking at plants from us (or the 2nd, 3rd, or more generations of plants from us) & pairing them up with internet pics. 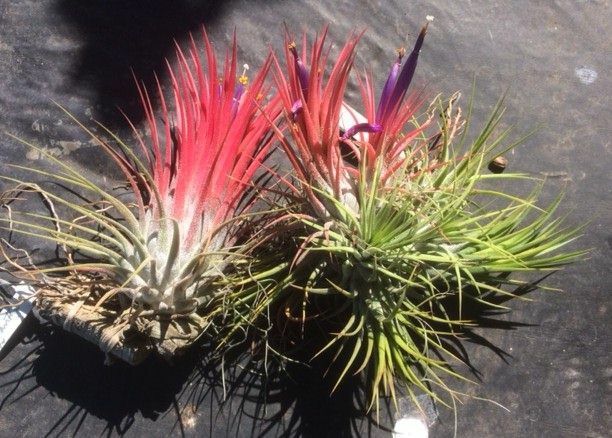 (Those Nutters who saw the strings of ionantha at the nursery, before it was pillaged for production since importing was reduced to a few countries, will know of the incredible variety we had.) I find it really odd that people want to name every form – I believe that names such as large curly, or large straight, or small Isley, are much better than registering every form I/we have. The situation where the Registrars keep criticizing the use of these terms gives us 2 options in my mind. Firstly, to lump them in with a named cultivar – which leads to what I feel will be a pointless classification of that cultivar, like we are seeing all over the place, not only with tillandsias. Secondly, we name every form – something I’d hate to see. I just use these “descriptive” terms, and often just so people that get plants from me don’t ask for the same things twice, and when plants don’t sell at a show I know which form it is when putting it back in the collection. A big job ahead for Derek. 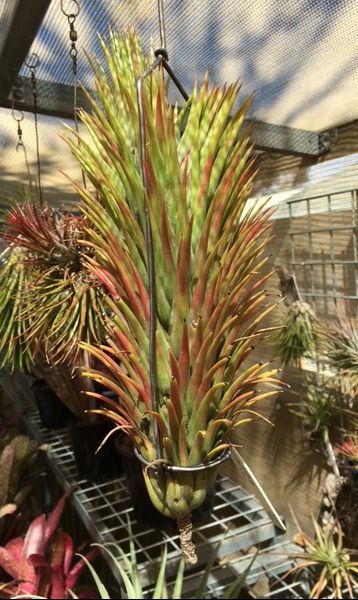 There has been some discussion here in Australia about the true identity of T. ionantha 'Cone Head' being grown. There have been a number of 'Cone Head' "versions" being grown and as you first grew this cultivar, I thought I would check some details with you. At the moment the Cultivar Register's entry has 4 different photos on file at: http://registry.bsi.org/?fields=Name&id=8035&search=Cone%20Head The first image on the left is from you and the rest are from different sources. _ _ More vexing issues with ionantha I see. I hope this helps. 1. Would you have (or can take) several more blooming photos of 'Cone Head' which you can email me for inclusion with this entry ? _ _ No bloomers currently available but the first two you sent look like a good representation. 2. Was 'Cone Head' a single clone or a selection of slightly-different clones ? 3. Was 'Cone Head' of wild origin--if so, approximately where (in Mexico somewhere?) and what year ? 4. If seed-bred in cultivation, what year was that? What was the source of the seed? 5. Is there a consistent blooming feature, hence the name 'Cone Head' ? If so, can you give details ? 6. Under your conditions, what would be the average mature rosette size of 'Cone Head' (width and blooming height )? I know T. 'Cone Head' has been in cultivation a long time (1980s?) 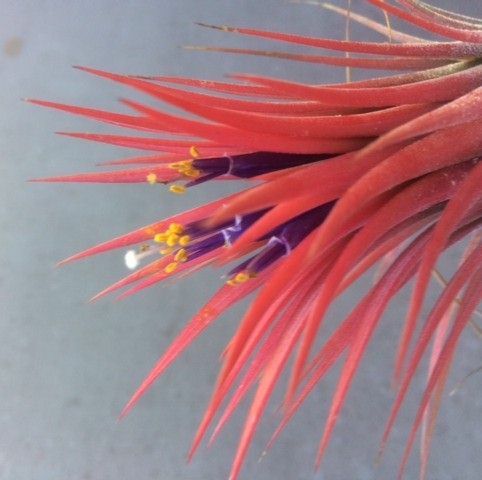 but somehow it has got mixed up with other T. ionantha forms we think. Geoff Lawn 17/05/18 ... Hi Frank, One extra query. When you said T. 'Cone Head' came from Guatemala in 1980, did you wild-collect it yourself, or, was it from a Guatemalan Export Nursery--and if so, which one ? Frank Messina, Tillandsia International 23/05/18 ... Hey Geoff, It came from Bromelifolia nursery. Geoff Lawn 29/05/18 ... I've had to revise the BCR entry of T. 'Cone Head', based on Frank Messina's replies to me (highlighted in red above). Frank's own old photo and that of Pachara Orchids are the only 2 photos Frank thought representative of T. 'Cone Head', so I have deleted photos by Jane Wu & Val Honeywood. T. 'Cone Head' versions have been circulating as such for a long time, so I don't think we can ever hope every other grower will change his/her clone to just "ionantha". Buyer beware, eh ? Derek Butcher 29/5/18 ... Geoff, I am still trying to get some answer from Dennis Cathcart as to his source of 'Cone Head' and why it looks 'different'!! !